This article is about the forged imperial decree. For the painting inspired by the decree, see The Donation of Constantine (painting). The Donation of Constantine (Latin: Donatio Constantini) is a forged Roman imperial decree by which the 4th century emperor Constantine the Great supposedly transferred authority over Rome and the western part of the Roman Empire to the Pope. Composed probably in the 8th century, it was used, especially in the 13th century, in support of claims of political authority by the papacy. Lorenzo Valla, an Italian Catholic priest and Renaissance humanist, is credited with first exposing the forgery with solid philological arguments in 1439–1440, although the document's authenticity had been repeatedly contested since 1001. In many of the existing manuscripts (handwritten copies of the document), including the oldest one, the document bears the title Constitutum domini Constantini imperatoris. The Donation of Constantine was included in the 9th century Pseudo-Isidorean Decretals collection. The text, purportedly a decree of Roman Emperor Constantine I dated 30 March, in a year mistakenly said to be both that of his fourth consulate (315) and that of the consulate of Gallicanus (317), contains a detailed profession of Christian faith and a recounting of how the emperor, seeking a cure of his leprosy, was converted and baptized by Pope Sylvester I. In gratitude, he determined to bestow on the see of Peter "power, and dignity of glory, and vigour, and honour imperial", and "supremacy as well over the four principal sees, Alexandria, Antioch, Jerusalem, and Constantinople, as also over all the churches of God in the whole earth". For the upkeep of the church of Saint Peter and that of Saint Paul, he gave landed estates "in Judea, Greece, Asia, Thrace, Africa, Italy and the various islands". To Sylvester and his successors he also granted imperial insignia, the tiara, and "the city of Rome, and all the provinces, places and cities of Italy and the western regions". What may perhaps be the earliest known allusion to the Donation is in a letter of 778, in which Pope Hadrian I exhorts Charlemagne, whose father, Pepin the Younger, had made the Donation of Pepin granting the Popes sovereignty over the Papal States, to follow Constantine's example and endow the Roman Catholic church. The first pope to directly invoke the decree was Pope Leo IX, in a letter sent in 1054 to Michael I Cerularius, Patriarch of Constantinople. He cited a large portion of the document, believing it genuine, furthering the debate that would ultimately lead to the East–West Schism. In the 11th and 12th centuries, the Donation was often cited in the investiture conflicts between the papacy and the secular powers in the West. In his Divine Comedy, written in the early 14th century, the poet Dante Alighieri wrote: "Ahi, Costantin, di quanto mal fu matre, / non la tua conversion, ma quella dote / che da te prese il primo ricco patre!" ("Ah, Constantine, how much evil was born, / not from your conversion, but from that donation / that the first wealthy Pope received from you!"). 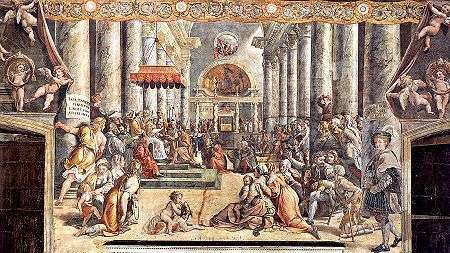 Workshop of Raphael, The Donation of Constantine. Stanze di Raffaello, Vatican City. During the Middle Ages, the Donation was widely accepted as authentic, although the Emperor Otto III did possibly raise suspicions of the document "in letters of gold" as a forgery, in making a gift to the See of Rome. It was not until the mid-15th century, with the revival of Classical scholarship and textual criticism, that humanists, and eventually the papal bureaucracy, began to realize that the document could not possibly be genuine. Cardinal Nicholas of Cusa declared it to be a forgery and spoke of it as an apocryphal work. Later, the Catholic priest Lorenzo Valla, in De falso credita et ementita Constantini donatione declamatio, proved the forgery with certainty. This was the first instance of modern, scientific diplomatics. Independently of both Cusa and Valla, Reginald Pecocke, Bishop of Chichester (1450–57), reached a similar conclusion. Among the indications that the Donation must be a fake are its language and the fact that, while certain imperial-era formulas are used in the text, some of the Latin in the document could not have been written in the 4th century; anachronistic terms such as "fief" were used. Also, the purported date of the document is inconsistent with the content of the document itself, as it refers both to the fourth consulate of Constantine (315) as well as the consulate of Gallicanus (317). Pope Pius II wrote a tract in 1453, five years before becoming Pope, to show that, though the Donation was a forgery, the papacy owed its lands to Charlemagne and its powers of the keys to Peter; he did not publish it, however. Contemporary opponents of papal powers in Italy emphasized the primacy of civil law and civil jurisdiction, now firmly embodied once again in the Justinian Corpus Juris Civilis. The Florentine chronicler Giovanni Cavalcanti reported that, in the very year of Valla's treatise, Filippo Maria Visconti, Duke of Milan, made diplomatic overtures toward Cosimo de' Medici in Florence, proposing an alliance against the Pope. In reference to the Donation, Visconti wrote: "It so happens that even if Constantine consigned to Sylvester so many and such rich gifts — which is doubtful, because such a privilege can nowhere be found — he could only have granted them for his lifetime: the Empire takes precedence over any lordship." Later, scholars further demonstrated that other elements, such as Sylvester's curing of Constantine, are legends which originated at a later time. Wolfram Setz, a recent editor of Valla's work, has affirmed that at the time of Valla's refutation, Constantine's alleged "donation" was no longer a matter of contemporary relevance in political theory and that it simply provided an opportunity for an exercise in legal rhetoric. The bulls of Nicholas V and his successors made no further mention of the Donation, even when partitioning the New World. Valla's treatise was taken up vehemently by writers of the Protestant Reformation, such as Ulrich von Hutten and Martin Luther, causing the treatise to be placed on the index of banned books in the mid-16th century. The Donation continued to be tacitly accepted as authentic until Caesar Baronius in his "Annales Ecclesiastici" (published 1588–1607) admitted that it was a forgery, after which it was almost universally accepted as such. Some continued to argue for its authenticity; nearly a century after "Annales Ecclesiastici", Christian Wolff still alluded to the Donation as undisputed fact. It has been suggested that an early draft of the Donation of Constantine was made shortly after the middle of the 8th century, in order to assist Pope Stephen II in his negotiations with Pepin the Short, the Frankish Mayor of the Palace. In 754, Pope Stephen II crossed the Alps to anoint Pepin king, thereby enabling the Carolingian family to supplant the old Merovingian royal line. In return for Stephen's support, Pepin gave the Pope the lands in Italy which the Lombards had taken from the Byzantine (Eastern Roman) Empire. These lands would become the Papal States and would be the basis of the Papacy's temporal power for the next eleven centuries. In one study, an attempt was made at dating the forgery to the 9th century, and placing its composition at Corbie Abbey, in northern France. 1 2 Vauchez, Andre (2001). Encyclopedia of the Middle Ages. Routledge. p. 445. ISBN 9781579582821. 1 2 3 4 "Donation of Constantine". Catholic Encyclopedia. New York: Robert Appleton Company. 1913. ↑ "The Donation of Constantine". Decretum Gratiani. Part 1, Division 96, Chapters 13–14. Quoted in: Coleman, Christopher B. (1922). Discourse on the Forgery of the Alleged Donation of Constantine. New Haven: Yale University Press. (Translation of: Valla, Lorenzo (1440). Declamatio de falso credita et ementita donatione Constantini.) Hosted at the Hanover Historical Texts Project. ↑ A slightly more ample summary is given in: Russell, Bertrand (2004). A History of Western Philosophy. Routledge. p. 366. ISBN 9780415325059. ↑ Migne, Jacques-Paul (1891). Patrologia Latina. Volume 143 (cxliii). Col. 744–769. ↑ Mansi, Giovanni Domenico. Sacrorum Conciliorum Nova Amplissima Collectio. Volume 19 (xix). Col. 635–656. ↑ Dante Alighieri. Inferno. Canto 19, lines 115–117. ↑ Monumenta Germaniae Historica. DD II 820. pp. 13–15. ↑ Toulmin, Stephen; Goodfield, June (1982). The Discovery of Time (Phoenix ed.). Chicago: University of Chicago Press. pp. 104–106. ISBN 0-226-80842-4. ↑ Coleman, Christopher B. (1922). Discourse on the Forgery of the Alleged Donation of Constantine. New Haven: Yale University Press. (Translation of: Valla, Lorenzo (1440). De Falso Credita et Ementita Constantini Donatione Declamatio.) Hosted at the Hanover Historical Texts Project. ↑ Setz, Wolfram (1976). Lorenzo Vallas Schrift gegen die Konstantinische Schenkung. Weimar. (Translation of: Valla, Lorenzo (1440). De Falso Credita et Ementita Constantini Donatione Declamatio). ↑ Duffy, Eamon (2006). Saints and Sinners: A History of the Popes. Yale University Press. p. 89. ISBN 978-0-300-11597-0. ↑ O'Malley, S. W. J. (2009). A History of the Popes: From Peter to the Present. Government Institutes. p. 59. ISBN 978-1-580-51229-9. ↑ Schnürer, Gustav (1912). States of the Church. The Catholic Encyclopedia. New York: Robert Appleton Company. ↑ Fried, Johannes (2007). "Donation of Constantine" and "Constitutum Constantini": The Misinterpretation of a Fiction and Its Original Meaning. Berlin: Walter de Gruyter. ISBN 978-3-11-018539-3. McCabe, Joseph (1939). A History Of The Popes. Watts & Co.